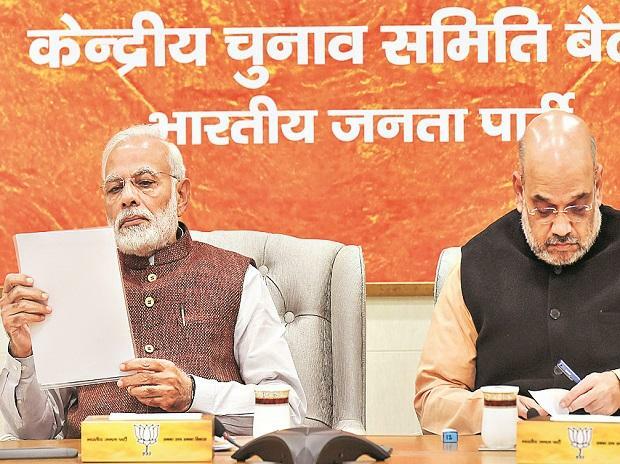 The Bharatiya Janata Party (BJP) on Monday released its poll manifesto for the Lok Sabha elections 2019. 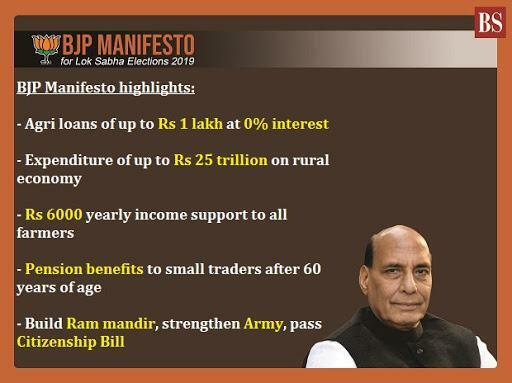 BJP president Amit Shah highlighted the government's achievements while Home Minister Rajnath Singh read out the key promises in the manifesto. He also headed the committee that drafted it. Promotion of Startups through creation of a ‘Seed Startup Fund’ of Rs 20,000 crore. Micro, small and medium enterprises to given Rs 1 trillion worth of credit by 2024. A pucca house to every family who are either living in a kuchha house or have no access to housing by 2022. BJP manifesto says it is committed to ensuring 33 per cent reservation for women in Parliament and state Assemblies through a constitutional amendment. Every Gram Panchayat to be connected through a high speed optical fibre network by 2022. Pradhan Mantri Kisan Samman Nidhi Yojana (PM KISAN) that provides Rs 6,000 a year to landholding farmers owning up to 2 hectares of land will be extended to all land-owning farmers irrespective of their landholdings. Set up one Medical College or Post Graduate Medical College in every district, through public or private participation, by 2024. Number of seats in central law, engineering, science and management institutions by at least 50% in the next five years. On the lines of Aadhaar project, complete digitization of land records to be initiated on a mission mode. Implementation of second-generation land reforms to ensure title guarantee for the landholder and reduce land-related litigation.